Also, the 86 year cycle in drought conditions in the midwest US seems to approach – is this why Marty thinks wheat will bottom this year? 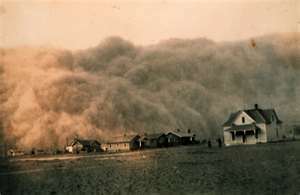 The below Wikipedia link mentions a “short drought” in 1890 in the US Great Plains, and then a dust storm on November 11, 1933, in South Dakota (43 years later). Wikipedia also mentions that the US Great Plains entered an unusually dry era in the summer of 1930 (a little more than 86 years ago), with droughts coming in 1934, 1936 and 1939-1940. I wonder if this is the year to go long wheat, especially since Marty forecast a bottom for this year? 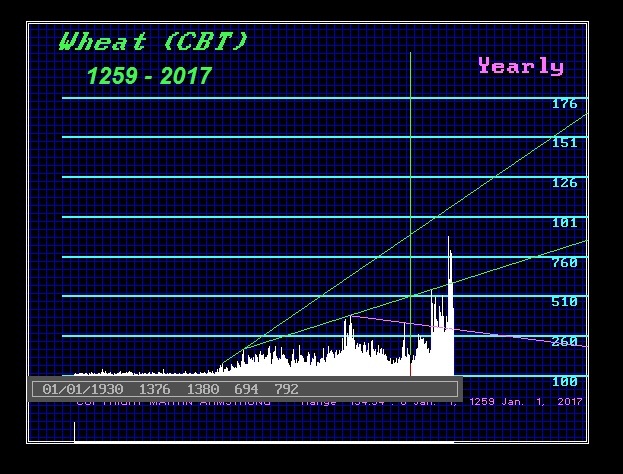 ANSWER: Here is a chart of Wheat from 1259 to 2017 with the currency converted to dollars from British pounds using the conversion rate at the beginning of the US dollar extending it back in time. Here we can see the overall trend. Yes, there is an influence with respect to weather. However, the Dust Bowl was a local event. What our computer is warning about begins next year with a Directional Change in Wheat. This cycle appears to be impacted by (1) significant climate change, and (2) the War Cycle. The combination of both is pointing to a bull market in nominal dollar terms.